A sold-out crowd of attendees gather during the AES International Conference on Audio Archiving, Preservation & Restoration at the Library of Congress National Audio-Visual Conservation Center (NAVCC) Packard Campus in Culpeper, Virginia, June 28-30, 2018. 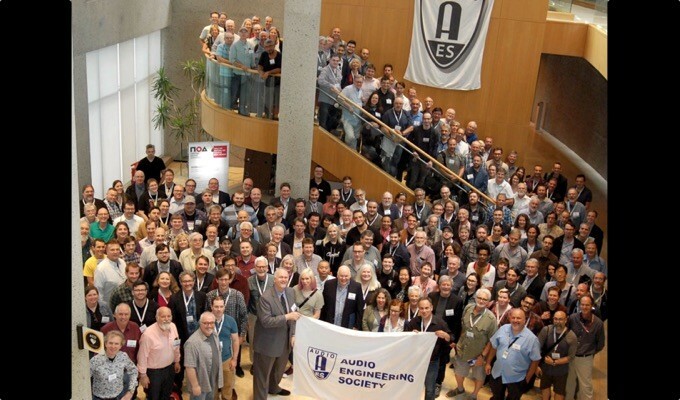 The Audio Engineering Society recently held its first International Conference on Audio Archiving, Preservation & Restoration to a sold-out crowd of attendees at the Library of Congress National Audio-Visual Conservation Center (NAVCC) Packard Campus in Culpeper, Virginia, June 28-30, 2018. Featuring premier presenters from leading organizations and facilities dedicated to the topics at hand, the Conference, chaired by educator and AES Past President John Krivit, offered an exclusive look into the art and science of creating and maintaining audio archives, as well as tours and access to the Library of Congress facilities and engineers. The event’s Platinum Sponsor, Iron Mountain Entertainment Services, played a key role in the Conference. “This hugely successful AES event was an exploration of topics that are near and dear to the overall missions of Iron Mountain Entertainment Services — preserving and archiving our industry’s most valued works,” stated Greg Parkin, Iron Mountain Entertainment Services Vice President, North America. “We are pleased that our very own Kelly Pribble was able to participate on the panel 'The Challenge of Archiving Multitrack Recordings' and contribute a treasure-trove of knowledge and experience alongside industry icons like George Massenburg and Jack Douglas. We look forward to working closely with AES and other key partners such as the Recording Academy to bring these important issues to the forefront." Building on the goals and standards of both the Audio Engineering Society and the Library of Congress, this year’s Conference served as a basis for further research and implementation of new techniques in the archiving, preservation, and restoration of audio assets. The challenges of preserving and providing access to the wide heritage of digital and analog media formats will also be a focus of the upcoming 145th International AES Convention being held in New York City, NY, October 17 – 20, 2018. The AES New York Convention will bring together a variety of experts representing corporate and national archivists, media companies, libraries, historical societies, labs, post-production professionals, universities and other more, to gain further insight into these increasingly important challenges and opportunities.